Here are some Really Cool Angular 4 FREE Themes that you can use complete for free! Yes, that’s right they don’t cost anything. Some of them are really professionally designed, business ready Angular 4 themes and more. There are some for Angular 2 and some for Angular 4 which is essentially the same thing so take your pick. Enjoy! Ani Theme is a Boilerplate for Animated Angular-2 Starter Theme written with Typescript and Bootstrap Sass. Powered by Gulp. If you’re starting an Angular-2 dashboard application then Ani-Angular-2 Theme comes very handy. It uses Angular 2 and Bootstrap 4 which makes it easy to use. It supports all major browsers and has a fluent and subtle page transition animation. CoreUI – UI Admin Kit is not just another Admin Template. It goes way beyond hitherto admin templates thanks to transparent code and file structure. And if it’s not enough, let’s just add the CoreUI consists bunch of unique features and over 1000 high quality icons. CoreUI based on Bootstrap 4 and offers 5 versions: HTML5, AJAX, AngularJS, Angular4 and React. CoreUI is meant to be the UX game changer. Pure & transparent code is devoid of redundant components, so the app is light enough to offer ultimate user experience. This means also mobile devices, where the navigation is the same easy and intuitive as in desktop or laptop. CoreUI Layout API lets you customize your project for almost any device – be it Mobile, Web or WebApp – CoreUI covers them all. Simple Dashboard Admin App built using Angular 4 and Bootstrap 4. This project is a port of the famous Free Admin Bootstrap Theme SB Admin v4.0 to Angular4 Theme. Provides fast, reliable and extensible starter for the development of Angular projects. A2 admin is an Angular admin dashboard template. It is fully responsive admin dashboard template built with Angular, Bootstrap 4, HTML5 and CSS3. It has a huge collection of reusable UI components and integrated with Angular Material. It can be used for all type of web applications like custom admin panel, project management system, admin dashboard, application backend, CMS or CRM. We’re constantly adding new features, improving existing ones and taking into consideration customers feedback. Mobile-ready design adopt to any device. Material design UI kit with tons of components with multiple layouts to choose and high resolution screens are well supported. You can use this starter kit to create amazing work for your CRM, CMS, ERP, Mobile Hybrid Apps, Desktop Application. All contain beautiful Material design. 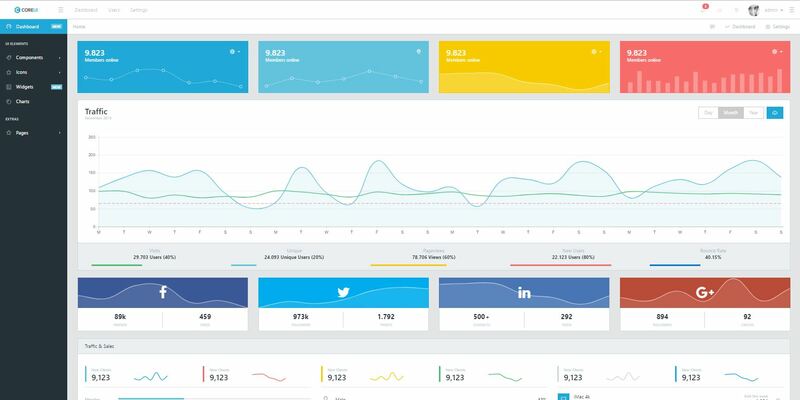 Light Bootstrap Dashboard Angular 2 is an admin dashboard template designed to be beautiful and simple. 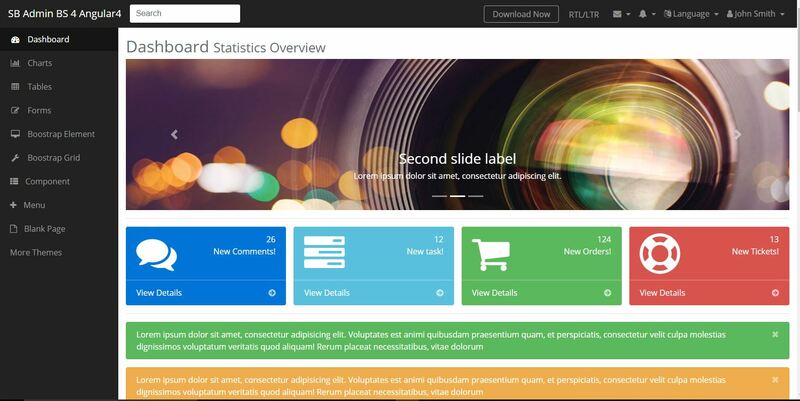 It is built on top of Light Bootstrap Dashboard and Bootstrap 3 and it is fully responsive. It comes with a big collections of elements that will offer you multiple possibilities to create the app that best fits your needs. It can be used to create admin panels, project management systems, web applications backend, CMS or CRM. BlurAdmin aims to bootstrap development of your product and provide ecosystem for building a prototype or even production-ready application. Despite frameworks like Bootstrap provide a number of components, usually it’s not enough of them to build real-world app. This template comes with lots of popular UI components with unified color scheme. ng2-admin aims to bootstrap the development of your product and provide an ecosystem for building production-ready application or prototypes. Material Dashboard Angular 2 is a free Material Bootstrap Admin with a fresh, new design inspired by Google’s Material Design. We are very excited to introduce our take on the material concepts through an easy to use and beautiful set of components. Material Dashboard was built over the popular Bootstrap framework and it comes with a couple of third-party plugins redesigned to fit in with the rest of the elements. Versatile theme is a Boilerplate for Animated AngularJS Starter Theme written with Bootstrap LESS. Powered by Gulp. If you’re starting an AngularJS dashboard application then Versatile AngularJS Theme comes very handy. It uses Angular v1.3 and Bootstrap 3 which just makes it easy to use. Material Design is a specification for a unified system of visual, motion, and interaction design that adapts across different devices. Our goal is to deliver a lean, lightweight set of AngularJS-native UI elements that implement the material design specification for use in AngularJS single-page applications (SPAs). AngularJS Material is the reference implementation of Google’s Material Design Specification. AngularJS Material includes a rich set of reusable, well-tested, and accessible UI components. If anyone wants to start their project with angularjs and good responsive framework other than bootstrap, then this is right choice. SemanticUI has lot of good component where developers needs to focus only on their bussiness logic rather than spending time on design. There are some really awesome professionally designed Angular themes you can get for free. They might not have all the features you need but they can be extended as you go features can be added to them. My advice would be to find the one you like which most closely matches your desired Angular app and then strip out all the code which you don’t need. After that you’ll be left with something from which you can build your awesome new app!